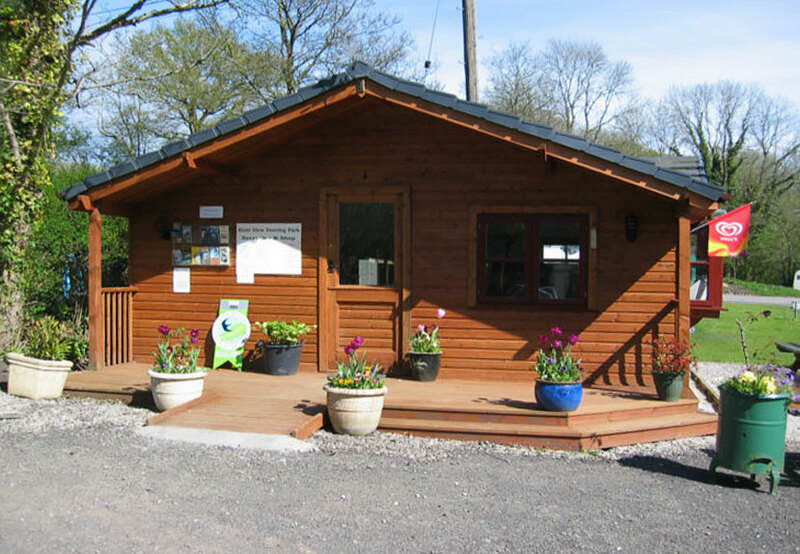 Access to River View Touring Park is via Lon-y-Felin, a short lane off the A483. Very large caravans and American Motorhomes have visited the site without any problems. All internal roads have a semi-permeable hard surface. Entry to Oakwoods and Gorse Meadows is via a short hill. The arrival parking at River View is level and access to the Reception & Shop is via a short ramp with contrasting colours on the edges and shallow steps. The entry door is 900mm (3 feet) wide with a small lip. Inside the building there is a high and low level Reception Desk, seating and ample room to access the shop shelves, freezer and chill cabinet. Access to the River View Shower Block is via a shallow concrete ramp with fencing to the outer edge. A level area then provides access to the 4 separate rooms via doors that are 820mm (33 inches) wide. All lighting in the amenities building are automatic and under-floor heating is used to maintain a comfortable temperature. All showers have thermostatic mixers with turn controls and all taps are lever mixers except the washing up sinks, which have individual lever pillar taps. The toilets are 6 litres flush with a high and low flushing setting. The showers and toilets are generously proportioned and provided with coat hooks. Each room has a soap dispenser and paper towel dispenser. All showers are provided with a plastic stool and a mop and bucket so they can be left clean and dry ready for the next person. The ladies have 4 toilets, 2 showers and 4 wash basins, two of which have mirrors over them. The gents have 3 toilets, 2 showers, 2 urinals and 4 basins, two of which are provided with shaving sockets/lights and mirrors. The family room has a shower, toilet, basin and a baby changing station. A bin is provided for the disposable nappies. The second room is fully equipped for the less able but can also be used as a second family room if not required by anyone with a disability. 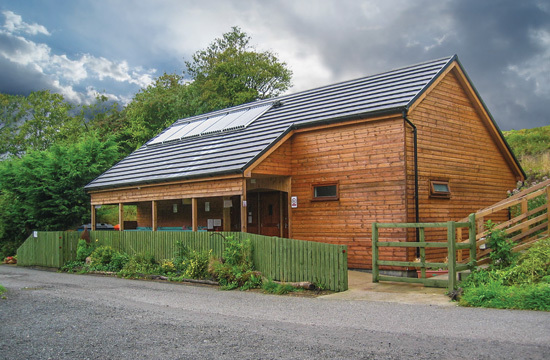 The facilities include a toilet suitable for wheel chair uses, basin and shower with level entry. Support handles and bars are positioned for each facility. An emergency call alarm is fitted and the door opens outwards. The washing up area has level access from the top of the ramp. It is covered by the overhanging roof with partial open sides. The 4 sinks have drainers. 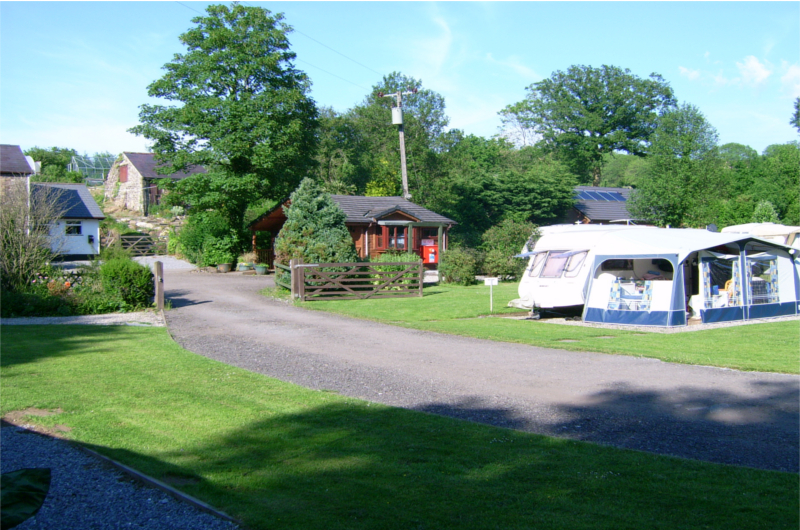 Three separate meadows are available at River View Touring Park and are a mixture of all weather pitches and grass. All pitches have 16 amp electric hook ups. The all weather pitches have a top dressing of 15mm stone and steel pegs are required for awnings. A low level of lighting is provided in all the meadows. River Meadow is mostly level with easy access to the reception/shop and amenities block, making it ideal for anyone with walking difficulty. Oakwoods Meadow has a gentle slope, or terraced pitches in places where the slope was less gentle. A large area in the centre is allocated for recreation but no play equipment is provided. 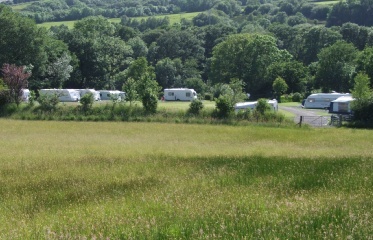 Gorse Meadow is smaller with all level pitches making it particularly suitable for tents. Oakwoods and Gorse Meadows gain pedestrian access to the amenities block, reception and shop via steps that are illuminated during the hours of darkness.